The AX Holdings proposal includes a ferry link from Sliema to Cottonera, with a stop in Valletta and a tunnel passing under the city, as shown in this artist’s impression. The ferry will pass through the new tunnel on its way to Cottonera and vice-versa. 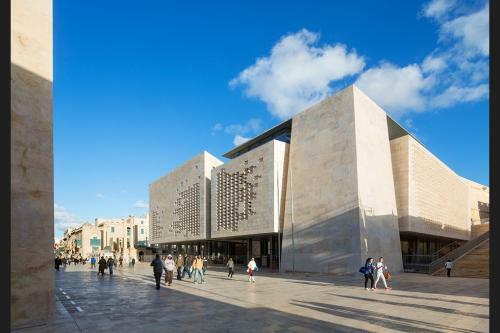 The 10 million euro investment in alternative transport links within the Grand Harbour and Marsamxett areas first was made by innovative AX founder Angelo Xuereb in 2015 in response to a call by Projects Malta. The pioneering scheme is expected to get under way soon following recent approval of the tunnel by UNESCO, which was necessary since the stunning fortress capital build by the Knights of Malta is a world heritage site. In all construction of the tunnel could take some 18 months, AX sources told the Italian Insider. I first learned about Mr Xuereb’s proposal while talking to Andy Tanti, Director of Sales at the AX Hotels in Sliema and Valletta over coffee in the comfortable Palace Hotel. 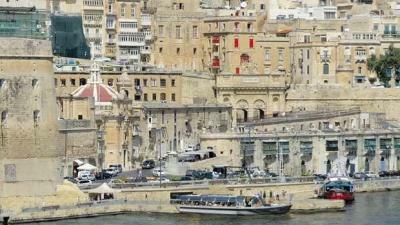 Malta has changed immeasurably since I first started visiting the island in the 1980s. St Julian’s Bay, for example, was a sleepy coastal village sought out mainly because the San Giuliano restaurant was tbe best on the island. The restaurant is still there, and still arguably the best in Malta, but skyscrapers have sprouted up along the coast so the bay now resembles Monte Carlo. Joining the EU helped kickstart the Maltese economy and as a result everyone of the island’s 450,000 inhabitants seems to own a car, making for massive traffic jams along vital coastal routes. Taking one of the island’s fleet of doughty buses from Sliema to a convention at another long-established AX hotel, the SeaShells Resort, at Qawra the journey was set to last as long as my flight from Rome so I had to jump out at St. Julian’s and hail a cab to make my appointment. 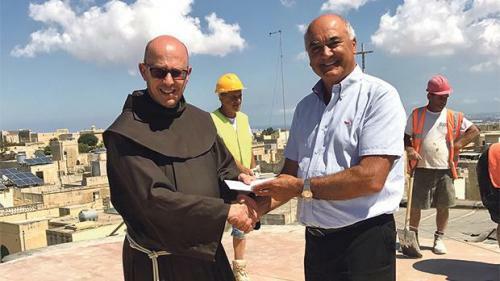 The tunnel and the ferries and water taxis that will use it will take some of the pressure off the road system in the latest of a series of ground-breaking contributions Mr Xuereb’s group has made to the Maltese capital in recent decades. Entering old Valletta one can admire the new Parliament building entrance built by AX and designed by Italian archistar Renzo Piano. A short distance away workmen are renovating a handsome Renaissance palace that will be launched in June as the Rosselli Hotel, the seventh hotel in the group which has 800 employees in all. With Ryanair and other airlines opening up new routes to Malta from Catania, Trapani and other cities tourism from Italy in particular is on the rise with boutique hotels like the Rosselli ideal for Italian and Italy-based visitors. Mr Tanti has seen the Group grow during 25 years with the company during which he rose to the senior sales position after starting as a swimming pool attendant. “It’s been an interesting journey,” he says. Other AX interests on the island include gastropubs, sponsoring the Malta Philharmonic Orchestra and the Hilltop Gardens sheltered housing complex for old people in the centre of the island. With its warm climate, English and other European widely spoken and annual property maintenance fees a fraction of what they would cost in northern Europe, Malta is an attractive proposition for anyone seeking a retirement hideaway steeped in history and tradition. However another, more ambitious tunnel project being proposed by the Maltese Government that would link the main island with Gozo has been questioned by environmentalists who fear it may sound the death knell for the delicate ecological balance on the smaller island.